Since 2005, Valancourt Books has earned a reputation as one of the foremost publishers of lost and rediscovered classics, reissuing more than 400 unjustly neglected works from the past 250 years. In this third volume of horror stories, the editors of Valancourt Books have selected fifteen tales (and one macabre poem) – all by Valancourt authors – for this new collection featuring horror from the 19th, 20th, and 21st centuries. This volume features previously unpublished contributions by Steve Rasnic Tem, Eric C. Higgs, and Hugh Fleetwood, as well as thirteen other tales that have never or seldom been reprinted. In this volume, you will encounter tales of ghosts, haunted houses, black magic, monsters, demonic babies, and vengeful spirits. Stories of the strange and sinister, of a boy who unwisely disobeys his grandfather's warning never to go up the stairs, a man whose apparently irrational terror of fire proves all too justified, an unpopular man who discovers a shocking new way of making friends, an ancestor who exerts a chilling influence from beyond the grave. 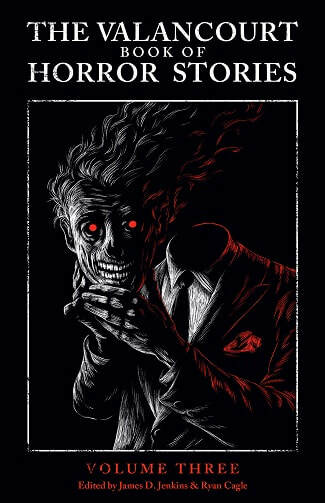 With stories ranging from frightening to horrific to weird to darkly humorous, by a lineup of authors that includes both well-known masters of horror fiction and acclaimed authors of literary fiction, this is a horror anthology like no other. The Standard Edition, featuring the headless phantom, is available for order through all online and physical booksellers or direct via our website, but the Special Tiki Edition is only available here on our site. 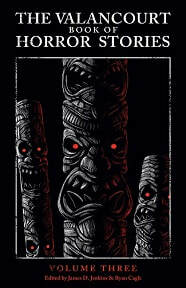 The cover is in honor of Eric C. Higgs's "Blood of the Kapu Tiki", one of the brand-new stories in the book, submitted to us shortly before the author passed away, and features a trio of nightmarishly terrifying yet oddly lovable tikis. Please note, both editions feature identical contents; only the cover illustrations differ, letting readers choose their own nightmare!